Although this is the first occasion I’ve had to begin mapping out my fall Urban Media Archaeology class, I’ve been mulling over the course content — the relationships between media systems and cities — for a decade or more. And for the past several months — ever since January, when I was asked to finalize the course description for a class that was then only a mirage on a distant horizon — I’ve been thinking about how to translate that content into various forms — the form of a syllabus, the form of an effective collaborative experience for my students, the form of a successful final class project. It’s been like playing Tetris: I’m piecing together pedagogical building blocks representing not only (1) the ostensible course subject matter, “urban media,” but also (2) methodology, including both the macro-level working models of “multimodal scholarship” [*] and the micro-level methodologies through which students will research their case studies; and (3) relevant theoretical frameworks, from media archaeology to science and technology studies to cultural geography. Our final project will be an interactive map. Rather than adopting existing mapping technologies and having to accept or work around their functional limitations (e.g., most are cartographically based and fail to represent urban systems that exist “beyond the grid”; most can’t capture the x, y, and z dimensions of urban space, which is especially important in a place like New York, a city distinguished by its verticality!) and built-in ideologies, we’ll build our own mapping platform in collaboration with the “URTingNYC” class in Parsons’ MFA program in Design and Technology. We’re not making a map for the sake of making a map — not because “mapping” is a pedagogical buzzword, or because of the popularity of information visualization. We’re making a map because, as I hope we’ll come to see, our subject matter lends itself to exploration through mapping, and mapping might enable us to examine our subject in a new way [again, see * below]. Students’ work will be both individual and collaborative: each student will be responsible for completing an individual research/production project — but he or she must frame and execute his or her project in light of how it might eventually “speak to” the others (in the end, we’re looking for synergies, for convergences and divergences, between the projects, and for a “larger story” that the collective class project can tell), and how it will lend itself to presentation not in a traditional typewritten text, but in a multimodal, online format. We’ll have plenty of group check-ins — both within our class and between our class and the Parsons URT class — throughout the semester, but the formal work of amalgamating individual projects into “clustered” themes with overarching arguments will require a few weeks at the end of the semester. So, unlike most of the classes I — and, I think it’s safe to say, most faculty — teach, which conclude with students handing in their individual projects at the very end of the semester, and perhaps sharing these projects with their classmates during the last class meeting, we’ll ask everyone to complete the bulk of their individual research and to have prepared beta-versions of their online presentation of this work before Thanksgiving, so that we can dedicate the final few weeks of the semester almost exclusively to reflection, making connections, and revision [**]. The presentations on the last day of class, then, will feature a project that has gone through multiple rounds of revision and refinement, and that reflects a great deal of careful thought about how 17 graduate students’ individual contributions, and the work of two graduate classes, coalesce into something greater than the sum of their parts. So, here’s how the semester might go. I’m still working on plans for a field trip or two; these excursions will likely take place outside of class, since ours is an evening class. The following schedule is still very much subject to change. I welcome feedback! #1: September 1: Review syllabus and course goals and structure. I introduce my own case study, which will focus on the interrelationships between New York’s telegraph, telephone, and pneumatic tube networks in the late 19th and early 20th centuries. Students discuss their preliminary case study interests [***]. Examine Manhattan Timeformations (below) and the Stanford Spatial History Project. For next class, read Friedrich Kittler on the “city as a medium,” James Donald and Vyjayanthi Rao on the “city as an archive,” and Erkki Huhtamo and Siegfried Zielinski on media archaeology. #2: September 15: Inserting the Urban into Media Archaeology. Introduce “media archaeology” and explore what it might mean if we interpreted “archaeology” more literally — if we actually looked for material evidence of the historical media systems that laid the foundation for our city’s contemporary media. For next class read Joel Tarr, Thomas Finholt & David Goodman on urban telegraph networks; Emily Bills on the history of Los Angeles’s telephone networks; Kazys Varnelis on the relationships between historical and new telecom networks; and a few historical documents from the New York Telegraph and Newspaper Transportation Company Records at the NYPL. #3: September 22: From Tubes to T-1s: Layers of New York’s electronic media infrastructures. 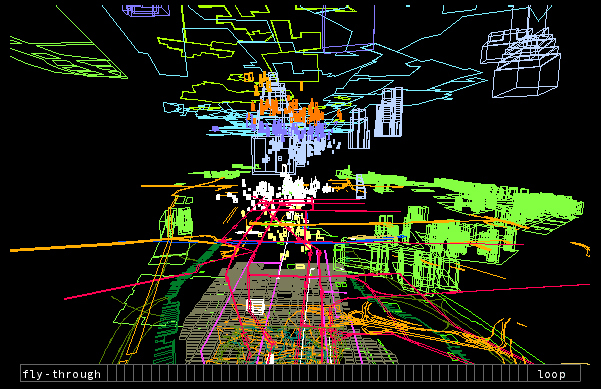 Consider how spatial representations might allow us to better understand the relationships among these infrastructures. Possible guest speaker. For next class, read Tara McPherson and Steve Anderson on multimodal scholarship and its genres, UCLA Digital Humanities & Media Studies’ “Digital Humanities Manifesto 2.0,” Todd Presner, Tom Elliott and Sean Gillies on digital humanities mapping. #4: September 29: Multimodal Mapping: Examine the affordances, limitations, and politics of mapping (and data visualization) as a scholarly and pedagogical methodology and mode of presentation. Study a few representative “digital humanities” and “critical art” projects: Commentpress, Pleriplurban, projects on Vectors, “Wunderkammer, Cornell, and the Visual Canon of Arrangement,” Manhattan Timeformations, etc. Experiment with various mapping case studies, from psychogeographical maps to sensory cartographies to scholarly projects like Hypercities, Pleiades, and examples from the Stanford Spatial History Project. Report on utility. For next class, develop proposal for individual projects and mapping tool features needed to support projects. For next class, read Alison Sant on mapping “off the grid,” Jeremy Hight on “rhizomatic cartography,” and Jesse Shapins on mapping in critical art. #5: October 6: Mapping and Researching in XYZ: Discuss mapping platform’s necessary functionality. Discuss methods for secondary and primary research for students’ projects [****]. Highlight relevant local research collections. For next class, read about media archaeology and urban history methods; archival and other primary research methods. Develop research plan. #6 – #10: October 13 through November 10: Case Studies: I will design these case studies to support students’ projects. Each week three or four students will present their work-in-progress — both their topical research and their emerging plans for presenting that research on the map. I will have chosen one short text relevant to each project, and we’ll discuss the students’ work in light of these texts, and in relationship to one another. From week to week, we’ll consider potential synergies between students’ individual projects, and how we might use the map to visualize/sonify/textualize those inter-project connections and to present an over-arching argument. For Week 11, all students must have posted a beta version of their projects on the map. #11: November 17: Networking Nodes: All students will deliver short presentations of their research. Each will receive feedback, and we’ll discuss what we might learn by layering or networking these projects on the map — and what modes of presentation can help us to convey these larger, multi-project arguments. #12: December 1: Final Case Study: We’ll consider one final “urban media system” that hasn’t been addressed in students’ projects. Reading TBD. Group Work. Students will have received edits for their individual contributions; these must be addressed by the following class. #13: December 8: Group Work. Plan for Presentation. #14: December 15: Mock Final Presentation. Identify Necessary Final Revisions. [a] hands-on engagement with digital forms reorients the scholarly imagination, not because the tools are cool or new (even if they are) or because the audience for our work might be expanded (even if it is), but because scholars come to realize that they understand their arguments and their objects of study differently, even better, when they approach them through multiple modalities and emergent and interconnected forms of literacy. The ability to deploy new experiential, emotional, and even tactile aspects of argument and expression can open up fresh avenues of inquiry and research (121). We’ll be exploring how this new method might allow us to ask new questions, to learn differently, to share our work with new publics and invite them into our process. [**] We’ll be thoroughly documenting our process — the dead-ends, the frustrations, the successes. This is in keeping with the digital humanities’ mission to promote transparency and to welcome other publics into the scholarly process. Our class will be pilot-testing the new mapping tool that we’re developing in concert with the Parsons “URTingNYC” class; we intend for this map to serve as a platform for future urban-related faculty and student work at The New School. Therefore, we need to think of our work as laying a foundation. In our project documentation we can make recommendations for those who come after us, encourage others to conduct new research on specific topics that will bridge existing student projects; encourage others to make use of promising collections we found in local archives, but just didn’t have the time to review; make recommendations for future tech developers to add new features to the platform so that it’s better able to accommodate the methods we want to employ; etc. [***] Students are welcome to join me in researching the history of New York’s telegraph and telephone networks. Others might focus on the history of the city’s publishing centers, its neighborhood newspapers, its low-powered radio stations, its recording studios, its tv cable networks, its telco hotels, its mail delivery routes, its movie palaces, its significant spaces of public address and debate, etc. [****] I’ll encourage everyone to begin by consulting published works on their topics and, in the process, to note particular libraries, archives, special collections, and other primary sources the authors have used in conducting their research. We’ll be emphasizing primary research; all students will be asked to work in local archives, make use of local experts, visit local sites, etc., and to use our map to feature and contextualize these primary documents. I’m making arrangements with the New York Public Library, the New York Historical Society, and other local collections to allow us special access and/or reproduction privileges; we’re especially encouraged to draw attention to underused collections. I’ll help individual students to identify other collections (public, private, and corporate) that might prove useful for their own work. We’ll need to keep in mind, though, that our purpose in posting this primary material is not simply to throw it all up online and say, “Hey, check out all this cool stuff I found in the archives!” Rather, we’re using these materials to help us build new, uniquely local arguments and New York’s historical media systems. An added benefit is that we draw attention to the offers of these local institutions’ collections. Students will also be encouraged to interview local experts — not only scholars, but also people wh0 have hands-on experience with their research topics. I, for instance, might record an interview with a postal service worker who used to man the pneumatic tubes at the General Post Office on 8th Avenue. A student focusing on cable television infrastructure might tour a particular neighborhood with a cable company technician and record the experience. A student focusing on immigrant newspapers might interview former publishers, or someone examining low-powered radio might talk with former DJ’s.